How to Decide: 4 Color or Spot Color? How do you determine whether four-color process (CMYK) printing will work for your design or project? Here are some tips to help you decide . . . 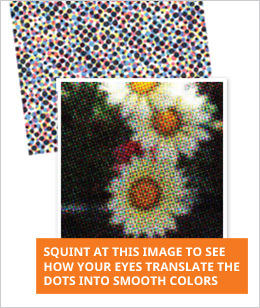 In four-color process printing, all colors are printed in dots, in the four process-color inks. The four process colors are cyan (C), yellow (Y), magenta (M), and key (black). Yes, the "K" in CMYK stands for key . . . because in four-color printing the cyan, magenta, and yellow printing plates are keyed (aligned) with the key of the black key plate. In traditional offset printing, those dots of color then form rosettes, like the ones shown [right]. Each color of dots is printed at a different screen angle. Fine lines, especially curved ones, can look jagged in four-color process printing, since each line must be comprised entirely of four colors of dots. Digital presses work a little differently, but most of them print only in the four process colors, in ink or toner. (The newest HP Indigo presses can also print a limited selection of spot colors.) Each pass for a double-bump requires a separate tower. If a coater is part of the equation, it changes the tower math, usually for the better! Do not go by how colors look on your monitor! Printed color and RGB color are not the same, and most monitors are not calibrated anyway. You’ll need to look at proofs (for CMYK) to see how the ink colors will really look on paper. When it comes to color reproduction, there are myriad factors to consider. I’ve been able to cover just some of them here, but I hope you will find this article helpful. About The Author: Nani Paape is a creative project planner and marketing copywriter who enjoys writing about complex processes in ways that make them accessible to everyday people. To read more of her printing stories, see her website, www.naniprints.com.